One appreciative fan at The Mavericks' June 7 concert at The Pageant gave the group a bit more than a standing ovation. He bought the musicians a round of iced Patron. The cocktail interlude early in the show was just the first example of the party atmosphere when The Mavericks bring their hybrid mix of country, Latin and rockabilly to town. Midway through the show, Malo told the audience he had a special announcement: Thursday was Lorenzo Molina’s (trumpet) birthday. The band and audience serenaded Molina and a roadie emerged from stage right bearing a cake with lit candles. If the scene on stage looked like a big party, the audience shared the experience. Behind the seats on the main floor and balcony, I counted about a dozen couples who found space to dance. Otherwise, the Mavericks give their fans what they came for: a rundown of all the hits from their discography through a marathon two-and-a-half-hour show. A number of people entered The Pageant wearing vintage Mavericks gear. They’ve probably heard the same songs in a dozen previous shows, but every member of the band plays and sings with the same enthusiasm as if it was their first big show. You wouldn’t know the band has been together for 25 years. They still make every performance fresh. The band formed in 1989 in Miami and built a successful fan base. They split up in 2003 but got back together for a few reunion shows in 2012. Since then, they’ve been recording new albums and touring every year. There is one feature of a Mavericks show that gives you a feeling of déjà vu if you’ve seen them before. The band members tend to dress in familiar attire. Malo wears a scarf and jean jacket. Guitarist Eddie Perez favors a tailored white suit. 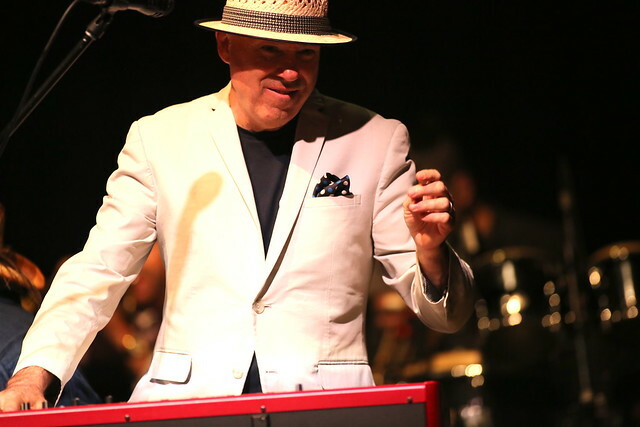 Keyboardist Jerry McFadden wears a porkpie hat and pastels. McFadden also gets an aerobic workout during a show – he dances and gyrates for nearly the entire concert. Check out the full set of photos by Bill Motchan over on his Flickr page.